1. HOW AND WHY DID THIS HAPPEN? IS THERE A PLAUSIBLE EXPLANATION WE CAN MAKE WITHOUT RASH JUDGMENT? Sister Lucy, the last of the three seers of Fatima, in responding to a militantly orthodox priest states: "There is a diabolical disorientation invading the world and misleading souls! It is necessary to stand up to it; . . . and, staying in my place, I pray for you and for all those who work with you." Sister Lucy deplores the fact that so many pastors: "let themselves be dominated by the diabolical wave invading the world," and are "blind men leading other blind men." Sister Lucy reiterates her observation that we live in a time of extreme rottenness on the part of many people within the Church and within society: "Foreseeing this [present] disorientation, the Virgin recommended recitation of the Rosary with such insistence as the prayer most apt for preserving faith in souls. It is because She already knew that these times had to come, when the devil and his supporters would fight so much . . . She armed us against this time of diabolic disorientation . . . and false doctrines." Cardinal Luigi Ciappi in his reference to the Third Secret: "the great apostasy in the Church will begin at the top." Regardless of what Sister Lucy is alleged to have said lately about the requirements for a valid consecration of Russia, this is a matter of simple common sense, employing the commonly understood meaning of words. To consecrate means "To declare or set apart as sacred: "consecrate a church" (American Heritage Dictionary). Imagine a bishop who insisted on consecrating a new church by consecrating the whole diocese without mentioning the church, on the theory that the church is part of the diocese. Or imagine a bishop who refused to consecrate the hands of a new ordinand, preferring to consecrate the whole body because, after all, the hands are part of the body. One would rightly question the bishop's mental competence. That the consecration of a thing needs to mention the thing consecrated is not a proposition rational people would debate.
. . . The Pope's spontaneous remark [the addition of "those peoples"] which was added to his March 25, 1984 consecration of the world to the Immaculate Heart implies that he knew he was not consecrating Russia on this occasion, and that the consecration would come in the future. Several hours later the implication became explicit when the Pope, while kneeling before a statue of Our Lady of Fatima, declared to Her before 10,000 witnesses: "We wished to choose this Sunday, the Third Sunday of Lent, 1984-----still within the Holy Year of Redemption-----for the act of entrusting and consecration of the world, of the great human family, of all peoples, especially those who have a very great need of this consecration and entrustment, of those peoples for whom You Yourself are awaiting our act of consecration and entrusting." Hours after the consecration of the world, the Pope's veiled reference to Russia-----"those peoples"-----described a nation still awaiting the consecration requested by Our Lady of Fatima. Worse, the 1984 consecration formula did not even mention "that nation" as needing to be consecrated, but rather "those peoples"-----a double veiling of the object of the consecration. After long study it is Catholic Tradition's position that when Our Lady referred to a "diabolical disorientation" she meant the term in two ways: disorientation of belief and practice, and a physical one, which began with the promulgation of the Novus Ordo Missae. And that this disorientation, being self-inflicted by Churchmen who fell away from Tradition, infected the whole Church and became our punishment from God for our laxity, our worldliness [material success and human respect], our forgetfulness of our utter dependency on God, and thus our lack of humility. Gerry Matatics, the Biblical scholar and Catholic apologist delivered a spell-binding series of lectures in Maine on the Mass and Divine mandates. He began by tracing through the various chastisements God permitted or sent man in the Old Testament for his infidelity to the Divine will, especially in the requirements for liturgy, not only for the sin of Adam. And as the Old Testament is prelude to the New Testament, so are the parallels. He discussed the history of the Roman Mass, starting with how the First Mass was said. The proper orientation for Holy Mass is facing East [whenever physically possible, given necessary limitations of some church architecture] or facing God, not the people. Until the Novus Ordo of Pope Paul VI, who on the previous page we cited, admitted that the "smoke of Satan" had entered the Church through some fissure, that orientation was held sacred and coming from Divine mandate. Much has been said by those favoring the despoliation, the outright destruction of the Roman Mass, that at the Last Supper, the Apostles did not face Christ, but reclined or sat on either side of Him. The modernists neglect to add that at the Last Supper only priests [the Apostles] and the High Priest [Christ] were present and that the Sacrifice of Blood [on the Holy Cross] had as yet to take place the following day. During the first 300 years of the Church, after the Ascension of the Lord, the persecution of Christians began, first at the hands of the Jews and then by the Roman Emperors. Mass was held as secretly as possible at designated homes, etc. But when the last persecution subsided, churches began to spring up and then we know that the Altar with a dividing Communion Rail, that is, Sanctuary and Nave being separated, was the norm. We know from the mystic, Ven. Catherine Emmerich, that before the dormition and Assumption of Our Lady, The Holy Mass was said at her house in Ephesus and that the priest-Apostle who offered the Mass said it as is done in the same posture as in the Roman [or Traditional] Mass. The concept that the altar here on earth represents the real altar before God's throne in Heaven, has always determined its position in our churches and the position of the priest standing before it: the angel with the golden censer is standing before the altar. Clearly, this notion is also based on the instructions that God gave to Moses (see Exodus 30: 1-8). These introductory observations are necessary to illustrate to what extent modern thinking about the altar has changed and differs from the traditional view. The change did not happen suddenly; it developed gradually and its origins go back to the years preceding the Second Vatican Council.
. . . many are under the impression that this change simply represents the revival of an early Christian practice. But we can show with certainty that there has never been, neither in the Eastern nor the Western Church, a celebration versus populum (facing the people); rather, the direction of prayer has always been towards the East, conversi ad Dominum (turned toward the Lord). The idea that the priest is to face the people during Mass has its origins with Martin Luther . . . in writing about the celebrant's position at the altar and how it should change, Martin Luther . . . refers to the Last Supper. Can we positively say this is how Jesus actually sat . . .? What we can say is that He probably did not-----simply because it would have contradicted the table etiquette observed in antiquity. At the time of Jesus and during the following centuries, no round or semi-circular tables were in use. The side of the table facing the observer remained empty: it was the side from which food was served . . . the place of honor . . . on the right side.
. . . It was in the thirteenth century that new type of illustration appears: Jesus is now sitting behind the table, in a center position, surrounded by his Apostles. It is this picture that Luther had in mind. It is true that this type of illustration looks very much like a celebration versus populum, yet the impression it gives is wrong because, as well know, "the people" whom the Lord would have been facing were not in the room in which the Last Supper took place. Luther's argument is simply invalid. Incidentally . . . Luther himself never insisted on the celebration facing the people: that practice developed later and then only in the parishes of the Protestant Reformed Churches. 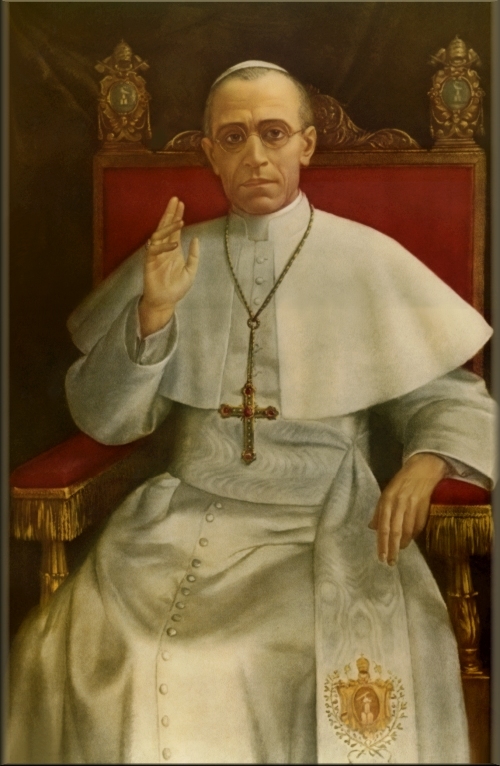 Back in 1947, Pope Pius XII, in his encyclical, Mediator Dei, said "We observe with considerable anxiety and some misgiving, that elsewhere certain enthusiasts, over-eager in their search for novelty, are straying beyond the path of sound doctrine and prudence." He was referring primarily to the notion of table and facing the people, a concept which had already taken on a certain appeal in some liturgical quarters. 4. Every liturgical rite constitutes an organically developed, homogeneous unit. To change any of its essential elements is synonymous with the destruction of the rite in its entirety. This is what happened during the Reformation when Martin Luther did away with the canon of the Mass and made the words of consecration and institution part of the distribution of communion. Clearly, this change destroyed the Roman Mass, even though it appeared that traditional liturgical forms continued unchanged-----initially even the vestments and choral chant remained. As soon as the traditional liturgical rite had been abandoned, however, the momentum for further liturgical change began to accelerate among Protestant communities. 5. Restoration of early liturgical forms does not necessarily constitute a change in the rite, at least not if this is done on a case-by-case basis, and if it is done within certain constraints. The Council did not elaborate on what the term "supervision of the sacred liturgy" (Sacra Liturgiae moderatio) means. If we consider past practices and customs, however, the term cannot mean the type of sweeping revisions of the Mass ritual and the alteration of liturgical texts that we are now experiencing. Rather, we must understand the real meaning in a larger context: Above all, the Council Fathers were intent on preventing every priest from "devising" the liturgical rite on his own authority"-----which, of course, is exactly what is happening today. Nor can the liturgical reformers derive their authority from Article 25 of the Liturgy Constitution, which says, "The liturgical books are to be revised as soon as possible." As has already been mentioned, the type of revision of the liturgy of the Mass envisioned by the Council was the Ordo Missae published in 1965. At the very beginning, the decree points out that the revision of the Order of the Mass is being issued because of the . . . the Council's Instructions on the Proper Implementation of the Constitution on the Sacred Liturgy. As recently as May 28, 1969, in an official letter written on behalf of the Pope and addressed to the Abbot of Beuron, who had sent to the Pope a copy of the new (post-Council) edition of the Schott-Missal, then Cardinal Secretary of State Cicognani stated, "The singular characteristic and primary importance of this new edition is that it reflects completely the intent of the Council's Constitution on the Sacred Liturgy." The letter made no mention of the fact that a comprehensive revision of this very Missal was already under way. Only four years had passed since the publication of the new Missal when Pope Paul VI surprised the Catholic world with a new Ordo Missae, dated April 6, 1969. The revision made in 1965 did not touch the traditional liturgical rite. In accordance with the mandate of Article 50 of the Constitution on the Sacred Liturgy, it had been primarily concerned with removing some later additions to the Order of the Mass. The publication of the Ordo Missae of 1969, however, created a new liturgical rite. In other words, the traditional liturgical rite had not simply been revised as the Council had intended. Rather, it had been completely abolished, and a couple of years later, the traditional liturgical rite was, in fact, forbidden. All this leads to the question: Does such a radical reform follow the tradition of the Church? Given the evidence we have presented, one cannot invoke the Council's decisions to support such an argument. As we have already shown, the assertion, which continues to be made, that the inclusion of some parts of the traditional Missal into the new one means a continuation of the Roman rite, is unsupportable. The argument could be made that the pope's authority to introduce a new liturgical rite, that is, to do so without a decision by a council, can be derived from the "full and highest power" (plena et suprema potestas) he has in the Church, as cited by the First Vatican Council, i.e., power over matters . . . "that pertain to the discipline and rule of the Church spread out over all the world") [Denzinger, 1831]. However, the term discipline in no way applies to the liturgical rite of the Mass, particularly in light of the fact that the popes have repeatedly observed that the rite is founded on apostolic tradition. [The author cites from Pope Innocent I, 402-417 in a footnote, to support this definition, but we have eliminated it for the sake of brevity.] For this reason alone, the rite cannot fall into the category of "discipline and rule of the Church." To this we can add that there is not a single document, including the Codex Iuris Canonici in which there is a specific statement that the pope, in his function as the supreme pastor of the Church, has the authority to abolish the traditional liturgical rite. In fact, nowhere is it mentioned that the pope has the authority to change even a single local liturgical tradition. The fact that there is no mention of such authority strengthens our case considerably. Now, you may ask, what has this to do with anything? For untold generations the Catholic laity has learned the faith primarily through the Roman or Traditional Mass, not only the greatest prayer, but the greatest teacher, for the Holy Mass is so complete in of itself that therein is contained all the Chief Truths of the Faith, the purpose of the Incarnation and the Sacrifice of Christ on the Cross, our destined end as willed by God, and it is the most efficacious means of obtaining the necessary graces whereby to attain to salvation. And just as the Protestant Mass [almost identical to the present-day Mass, except it was actually less banal] changed the beliefs and practices of those who attended it within a single generation, so did the Novus Ordo. As we stated earlier, whenever the Jews were unfaithful in worship, or lax, God visited them with a chastisement, delivering them up to their sins, until right order of worship was restored, and that right order is derived from His prescription, not man's. The Third Secret was supposed to be revealed by 1960, when Our Lady told Sr. Lucia, "it would be made clearer", that is the full meaning of the Third Secret, which has never been accurately revealed by the Vatican as requested by Our Lady. For a comprehensive understanding of the failure of the Pontiff and the hierarchy in this matter, you need to read FATIMA IN TWILIGHT, by Mark Fellows. It is not within the scope of this little treatise to present the full story. Weakened by a merited loss of grace, the hierarchy, including most especially the papacy, lost much of its will to stamp out dissent, outright heresy, and halt completely incorrect translations and/or the deliberate change of parts of the Mass by priests, that have been repeatedly the scourge of the Western rite. Two prominent examples: The Latin version of the Novus Ordo Mass says "pro multis" and has always been translated as "for many" but the English translation says "for all" which many suspect may invalidate the Consecration, causing consternation and alarm; at the very least a cavalier attitude not in keeping with Tradition and a Catholic sense. Then there is the matter of the "Mystery of Faith", which the Church has always taught refers to Transubstantiation, the changing of bread and wine into the Body and Blood of Christ while retaining the appearances of bread and wine; the Novus Ordo has rendered it various other concepts that change depending on the priest's preference. "Christ has died, Christ will come again," etc. is not the Mystery of Faith. In fact it is not only not the Mystery of Faith, it is outright heresy to suggest that it is the Mystery of Faith, whether intended or not. Such carelessness, did it lead to the loss of grace and as a result has the hierarchy permitted the Church to be infected with a homosexual subculture which has all but destroyed much of the institutional Church [as opposed to the Church as the Mystical Body and Bride of Christ, that is, as conceived by Him] as we have always known Her, because of this loss? We are by now beginning the second generation of Catholics who have never known the Roman Mass. And like the Protestants before them, it is the Mass above all, wherein they receive most of their instruction. The spirit engendered by the New Mass is Protestant to the core and thus every modern Catholic not given the grace [or not cooperating with grace] to see this, becomes in essence his own pope, deciding for himself what he wants to believe. Of course, we must not give in to the temptation to over simplify, but this is what has occurred, essentially. I must add that the "fissure" mentioned by Pope Paul VI could not have become so wide a crack in so short a time span unless the initial break or crack was there before the Second Vatican Council unleashed the spirit of the world. That crack was the sin of contraception. It is not the purpose of this exposition to discuss the evil of contraception at length, but to set the stage for the first rupture. When I use the phrase, "the sin of contraception", I am speaking generally, statistically, not indicting every single Catholic family of the past generation. Whenever we are persistently and wantonly unfaithful either in doctrine or in morality, God delivers us up to our iniquity and spiritual blindness sets in. Another name for spiritual blindness, is diabolical disorientation. So that the first disorientation-----uprooting ourselves from natural conjugal rites [so to speak] led to uprooting ourselves from natural orientation in worship or rite, and vice-versa, which led to the morass of confusion wherein we now find ourselves. Catholic Tradition, after much study and only after many years, concludes that until the actual Consecration of Russia, not the world, to Our Lady's Immaculate Heart is effected as requested by the Mother of God, this disorientation or uprooting from Tradition will worsen. The "errors of Russia" requiring the Consecration comprise much more than atheism on the part of the state and socialism-communism, but the savaging of all society through abortion and contraception, genocide of nations beyond war, a war on innocent life out of sheer power. Apart from this sin against the sanctity of marriage, many of us older Catholics, who had been raised a generation before 1960, were complicit in the debacle because we had the true faith, knew it and knew our duty and gave in to human contrivance and convenience. How? When the first Novus Ordo Mass in the early 70s was introduced in our parishes, most of us, myself included, did not get up and walk out. Obedience is one thing, even at great personal discomfort but novelty and sacrilege are not mandated by true obedience. And the way those first Masses were said left no doubt about the reality that had been imposed on us with our latent, but very real permission and the trajectory that had been unleashed. By our silence we gave assent and set a bad example for our brethren who had less instruction, whatever the reason, signaling to them that the assault on the Mass was okay, especially since they looked to us who had taught catechism for a sign. When they gave us dancing girls in sexually explicit costumes as part of Christmas Midnight Mass, in our horror and shock we never went back to that yearly Mass when they were used, but we said nothing, at least I did not and know nothing about anyone else saying something, that is, no one ever said to me that he had spoken to the pastor. When the priest asked his daily communicants to join him at the altar just before Communion, some went up, but those of us who knew better and who realized by that time-----a few short years had passed-----that something was very amiss and refrained, still said nothing. And so forth. It took years before I worked up my courage. Oh, I suppose I could make a lame excuse by saying [truthfully] that I was by then confused about my responsibilities regarding obedience, the indefectibility of the Church and Her Sacraments, papal infallibility and authentic papal authority. My confusion was punishment for my previous silence, when I was not confused. I suppose there could be some mitigation of my guilt, but I won't make any claim for it. The awful truth is that I failed you and I failed my children and most especially I failed the Church and because I did, I failed as a soldier of Christ, sinning utterly against Him. I say all of this knowing that even if I had spoken up sooner I would have not had any effect, most likely, given the frenzy for novelty at the time, but I will never know this; God expects us to try our best, even if we do not succeed. We are not supposed to be the scorekeeper, He is. The Church has always taught that the more learned and advantaged have a greater responsibility than those who have less and thus I know I will be judged more harshly than God will judge you and your generation, so I do not absolve myself from any guilt, simply because I will merit whatever punishment God has designated for me. I want you to remember all I have written in the above two paragraphs very carefully as I will be discussing this in the following parts within the context of the situation you find yourself in. In Part 2a: Tradition, its sources, along with indefectibility and infallibility will be explained. The sin of rash judgment is committed when we assume something lacking in another's character or impugn evil motives without sufficient evidence or reason. To assess a situation, no matter how foreboding the conclusion is not the same thing, provided the assessment is not a direct assault on the character of persons in a rash manner. We are assessing our condition within a context, not impugning deliberately evil motives to any Pontiff. Just as a well-intended father, who has the authority for maintaining the order of the household entrusted to him by God, can err by being either too rigorous or too lax, so, too, our Pontiffs, who are our spiritual fathers. Whether sinful culpability is attached to any particular Pope, that is up to God, not any of us. Our duty is to save our souls and evangelize the world as best we can. Before we go to Part 2a, I want to say again that I am unworthy to be the one to respond to you, as I am part of that previous generation. You and your fellow parishioners of the same age are not to blame. You are even younger than my youngest son. My children and you have inherited this Hell on earth precisely because we did not always do our duty, but chose the easy way far too often, partly out of fear of human respect, which will be discussed in Part 3. For now, I ask you to accept my most heart-meant apology just as I constantly repent and ask the Divine Majesty for mercy; and I ask you for your forgiveness. Scarcely a day does not go by when I am brought to tears for my part in what has been wrought . . .